The understanding of our unique purpose depends on how we answer this question. The ‘What on Earth Am I Here For?’ Campaign is an all-new 6-session video & workbook teaching from Pastor Rick Warren. Inspired by the original Purpose Driven Life small group study, this all-new curriculum is designed to unite and ignite small groups in your Church. 10 years ago, Pastor Rick Warren wrote The Purpose Driven Life that changed the way millions of people understand their meaning and significance. The book has since become the best-selling nonfiction hardback book in history. This transformative book has been expanded and reimagined with 2 new chapters, a new cover, and free online extras that address the crucial needs of a new generation. Register for a campaign and receive the benefits below. Cost of registration and Campaign Preview Kit: £50.00 - available from the end of November 2012. TO REGISTER COMPLETE THE REGISTRATION FORM BELOW OR PRINT OUT AND RETURN A PAPER FORM. WHEN WE RECEIVE IT, WE WILL SEND YOU YOUR CAMPAIGN PREVIEW KIT. This ‘What on Earth Am I Here For?’ Campaign Preview Kit contains examples of all the materials your church members and small groups will need to participate in this Campaign. The understanding of our unique purpose depends on how we answer this question. The ‘What on Earth Am I Here For?’ Campaign is an all-new 6-session video & workbook teaching from Pastor Rick Warren. Inspired by the original Purpose Driven Life small group study, this curriculum is designed to unite and ignite small groups in your Church. The Purpose Driven Life Expanded Edition Book – The book that has transformed millions, now with 4 New Features including bonus chapters and 30 hours of online extras. Small Group Study Guide – Designed for use with the DVD, this six-session guide will take participants on a journey that will change their lives. 6 Week Small Group Teaching DVD – Six 25-30 minute video messages taught by Pastor Rick for small group study, Sunday school, or adult education class. Campaign Success Guide – Helps you plan, promote and implement the ‘What on Earth Am I Here For?’ Campaign for your congregation. FREE The Purpose Driven Church – A must read for all Pastors and Church leaders. Voted as the most influential on the lives and ministries of American church leaders according to the Barna Group, this sums up the Purpose Driven Paradigm of Church leadership. 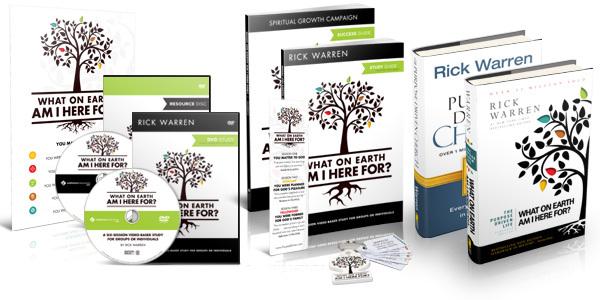 Campaign Resource Disc – Contains many tools to help you customize the Campaign specifically for your church, such as ‘What on Earth Am I Here For?’ logos, promo videos from Rick, web banners, PowerPoint templates, etc. Key Tag Set, Bookmark, and Lobby Poster – Samples of these ‘What on Earth Am I Here For?’ Campaign support tools.